We took advantage of some days with reasonable weather in January and went hiking in Busiek State Forest and Wildlife Area. 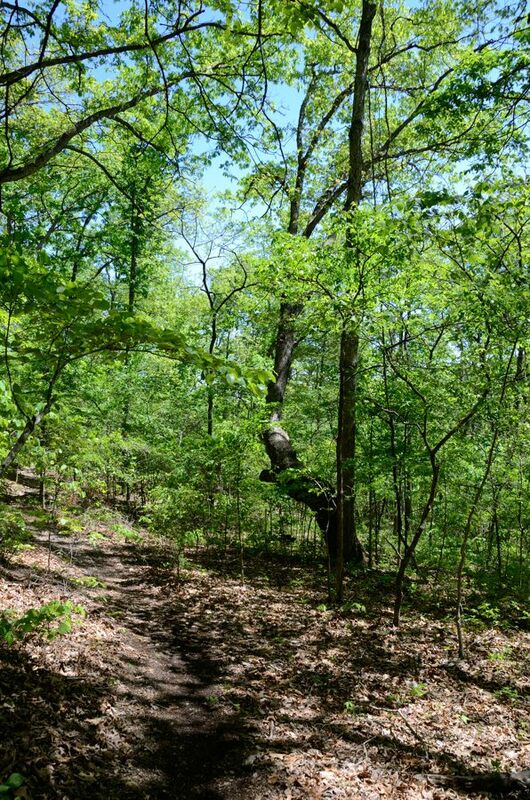 Busiek is just 20-minutes from Springfield, so for us, it’s a great place for a quick day hike. This entry was posted in Campfire Chat, Our hikes and tagged Busiek Silver Trail, Busiek State Forest and Wildlife Area, Hiking on January 25, 2018 by Gary. This entry was posted in Hiking, Our hikes, Places We've Been and tagged Busiek State Forest and Wildlife Area, Busiek Yellow Trail, Hiking, Ozarks on February 7, 2016 by Gary. This entry was posted in Campfire Chat, Hiking, Our hikes, Places We've Been and tagged Busiek State Forest and Wildlife Area, Hike, Hiking, huaraches, Missouri, Ozarks, Xero Shoes on January 31, 2016 by Gary. We’re still working on getting back in condition. Today, we wanted to increase the distance and elevation climbed while, not getting too wet and muddy, and not driving too far. We settled on hiking the complete Silver Trail at Busiek State Forest and Wildlife Area. This entry was posted in Hiking, Our hikes, Places We've Been and tagged Busiek Silver Trail, Busiek State Forest and Wildlife Area, Hike, Hiking, Missouri, Missouri Department of Conservation, Ozarks on January 24, 2015 by Gary. Sunday we hiked part of the Busiek Silver Trail. Wednesday we decided to go back and do the complete trail. This entry was posted in Campfire Chat, Hiking and tagged Busiek Silver Trail, Busiek State Forest and Wildlife Area, Christian County, Hiking, Missouri, Ozarks on February 9, 2013 by Gary. Commitments for the kids, work projects, and voluntary work have all conspired to keep us from hiking, camping and backpacking for the past couple of months. This afternoon we made the effort to leave our desks behind and hike what we call the ‘Hill Loop’ of the Busiek Silver Trail – 2.58 miles and 574 ft of Elevation. This entry was posted in Hiking and tagged Busiek State Forest and Wildlife Area, Christian County, Hiking, Missouri, Ozarks, slide on February 3, 2013 by Gary. We hiked the Busiek Red and Yellow trials today – 5 miles and 596 ft. of elevation. We ventured off trail for a while so I could show Ginger some of the things I’d discovered when I backpacked through here in June. This entry was posted in Hiking, Our hikes, Trip Reports and tagged Busiek State Forest and Wildlife Area, Christian County, Hiking, Missouri, Ozarks on October 2, 2012 by Gary. Hiking the Busiek Purple and White trails this week we discovered that the steep climb/descent at the southernmost point on the white trail has been replaced with a series of switchbacks. This entry was posted in News and tagged Busiek State Forest and Wildlife Area, Busiek White Trail, News on April 18, 2012 by Gary.